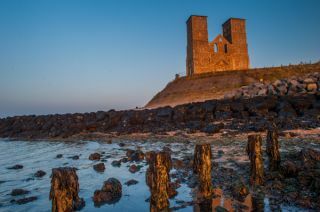 Reculver Towers are a striking pair of 12th-century church towers built within a Roman fort on the very edge of the Wantsum Channel. 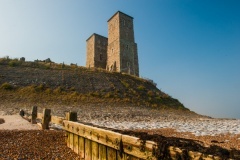 The towers, known as 'The Two Sisters', were erected on the foundation of a 7th-century Saxon church. The 12th-century church is gone now, the victim of erosion from the constant wear and tear of waves on this seaside location. Around AD 200 the Romans established a fort they called Regulbium on the edge of the Wantsum Channel that separated the Isle of Thanet from the British mainland. 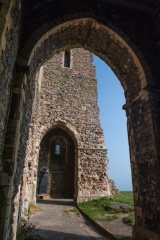 Reculver acted as a supply base and soldiers stationed here fought both within Britain and overseas. It was the northern counterpart to Richborough Fort, st the south-eastern end of the Wantsum. Sailors from the fort operated naval patrols along the coast, countering the effect of Frankish and Saxon pirates. The garrison was made up of men from the 1st Cohort of Baestasli, 480 soldiers from western Germany. It seems that the fort was not the first Roman presence on this spot, however. 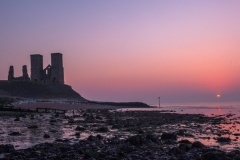 It is likely that there was a settlement at Reculver as early as the 1st century, so the fort may simply have protected an existing presence, built to answer the threat posed by 3rd century Saxon raiders along the south coast. his would make it one of the first Saxon Shore forts, a series of armed sites on both sides of the English Channel. The fort was square, with a gatehouse in the centre of each side, and enclosed an area of 3ha. The wall reached 7.5 metres high, with a parapet walk. 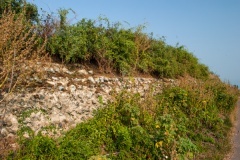 Outside the wall were two steep-sided ditches to deter attackers. Fragments of the east gate remain, with ruins of a small guard chamber. Within the perimeter wall were barracks, officer's quarters, a bath house, granaries, storehouses, and a Principia, or headquarters building. During archaeological excavations an inscribed tablet was found in the Principia strongroom, commemorating the construction of a hall and shrine around AD 210-240. The fort was in use for 2 centuries until the Romans left Britain around AD 410. 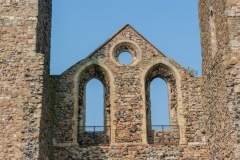 After the departure of the Romans the site was abandoned until AD 669, when King Ecgberht of Kent granted it to St Augustine's Abbey in Canterbury for a new monastery. In that year a priest named Bassa built a monastic church here, dedicated to St Mary the Virgin. The new church almost certainly reused Roman stone as building material. The church was simple, with a nave and rounded chancel, and side chambers. We do not know precisely when the monastery itself was abandoned; it was probably after Viking raids started in this area around 800AD. There are no visible remains of the Saxon church above ground, though the foundation outline is marked by modern concrete. 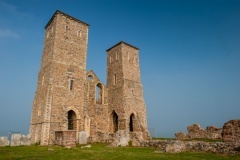 The Saxon church was reused as a parish church after the Norman Conquest and was rebuilt in the 12th century when the distinctive towers were added. The church finally fell out of use in the 19th century when erosion made the site untenable. In 1805 church was pulled down, all except the striking pair of towers at the west end of the church, which were left standing to act as an aid to navigation. Stone from the old church was used to construct a new church on higher ground at Hillborough. Trinity House purchased the towers in 1809 and strengthened them so they could continue to serve as a visible landmark for sailors. 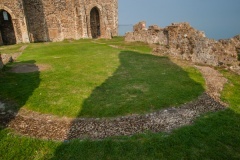 To emphasize how drastically erosion has affected Reculver, it is sobering to think that the church originally stood almost in the centre of the Roman fort, while it now stands at the edge of steep sea cliffs. Roman: The Roman fort of Regulbium was built here by the Emperor Carausius in the 3rd century. 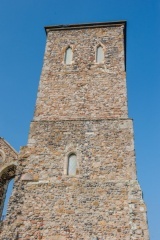 The striking twin towers of a 12th-century church stand within the boundaries of the Roman foundations. Location: Well signposted, 3 miles east of Herne Bay. There is a paid parking area immediately beside the fort.